Why did I never build one of these before? Honestly, I didn't think I liked them. way back when Dark Eldar were new and Guard had just had the Catachans come out, a friend of mind went mad for the lil’ rambo guys. and that included the sentinels. I didn't like the Catachans, still don’t but I think my dislike of them got wrapped up with a perceived dislike of the sentinel and there we were. I never revisited that opinion. 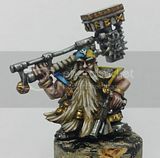 Fast forward to now, and I’m creating a Veteran guard force who are (if such a thing as fluff exists for my armies) a foward element, recon and fast strikes. So what fits with that list? scout sentinels. I felt I had to include at least one. What can I say, I’m a convert – I really like this kit and think this fellow will be getting a friend. Nice work on this model. I am really surprised to not see more of these on the table. Even with AC 10, they can create Havoc coming on from an edge. That's one nice looking walker mate, I might have to dig out the kit and put another together for my force. Nicely done. I suspect that the AC is the most versitile load for a sentinal. I've always liked the plastic Sentinel. It is a fun kit to put together. I really like the two-tone painting style with this one. Wish I'd thought to mine like this. The old catachan sentinals I always loved, for I like your friend started out as a Catachan player. I always thought the sentinal kit was fantastically versatile. The new kit blows the socks off the old one. From the multi-posable legs to the varied weapon loadouts, sentinals are arguably my favourite kit. I have 6 old ones painted, along with 4 more old and 5 new still to paint - as well as having plans for 3 more converted ones. They're just so easy to work with! Hi Guys, thanks for stopping by, and for commenting. Magilla, yeah I think to get value for money out of these guys you have to take the scout version. outflanking two heavy weapons at such a cheap points cost has got to be a good distraction unit at the very least. and if it pops a light vehicle or nails an meq or two it's a bonus. ZZzz, yeah I went with the ac for versatility. I mean, a lascannon is good, but with 1 shot at BS3 its not going to be a terrible distraction. 2 s7 shots however.. and if you take two of them, 4 S7 shots, now we're talking about something problematic :) and with outflank you can pretty much guarentee rear/side shots. Kevin, as I said, it's my first one and i'm totally a convert. not sure what you mean by two-tone though? the paint on the elgs? or the overall metal/paint look? Ginge, welcome :) yeah it's nice having the weapon options, I suppose the one i would want though, (which would make it op i expect) would be the multi-melta like the elysian drop sentinal. pop pne of those on an outflanker and youre getting some serious trouble :) but yeah, I can see now why spains GD had two of em take silver and gold one year. wicked kit.